Shop Local movements have steadily gained traction in communities both large and small. National organizations as well as local Chambers of Commerce, Economic Development Corporations, and Convention and Visitors Bureaus are often taking the lead to promote various initiatives to strengthen local economies. 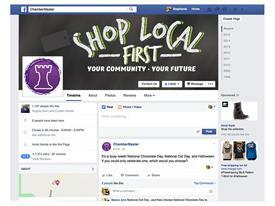 In continued support of these efforts, the ChamberMaster team is providing a free “Shop Local First” Facebook cover image (the image and download instructions are below). It is our gift to you. Use it for the holiday season, during National Independents Week in July, to promote Small Business Saturday, or any time of year! We’re also including this “Top 10 Reasons to Shop Local First” list. 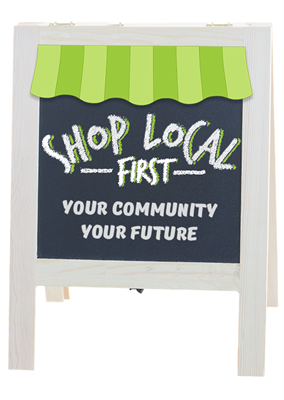 Share it on social media, post it on your website, or use it for talking points when promoting the “Shop Local First” message in your community. We understand that it matters where consumer and business dollars are spent. In fact, ChamberMaster is a proud participant in Lakes PROUD, a collaboration of 5 area Chambers of Commerce to grow our regional economy. Use the resources we’ve provided in this article to let your community know why it’s important to Shop Local First and tell us how it goes! Position your mouse pointer over the image, above, then right click mouse. On the pop-up menu, select "Save Image As" and save. Position your mouse pointer over the image, above, then press the Control (Ctrl) key and click the mouse button. On the pop-up menu, select "Save Image As" and save. Press and hold the image, above. The shortcut menu appears after you lift your finger.